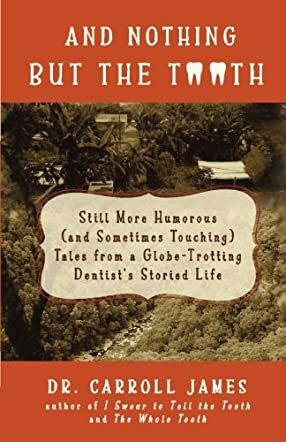 I knew And Nothing but the Tooth: Still More Humorous (and Sometimes Touching) Tales from a Globe-Trotting Dentist's Storied Life by Dr. Carroll James was going to be interesting with a title like that. I was not disappointed. James has filled yet another book with humorous stories from his life experiences. The reason I chose And Nothing but the Tooth was because of the title. I also like books that have a lot of short stories in them. I thought that James’ stories were fun and at times relatable. I totally related to Kate’s reason for not eating things that look at her. I also liked that his sarcastic attitude shone throughout all of his stories. He definitely has a flair for storytelling. It did make me wonder if the friends that he wrote about approved of their stories and his opinion of them. James has also lead an interesting life, having traveled all over the world. In fact my favorite story of his was when he was in Belize telling his patients to “die”. This is the reason dentists are scary! Although I have to admit that I have trouble pronouncing Spanish words too! James has written a few other books about stories from his life, but this is the first of his that I have read. His other books also have interestingly named titles, which makes me want to read them too. If you like short stories and are not too afraid of dentists, then I recommend you read this book! I too found this book, And Nothing But the Tooth wonderfully engaging. This is the third book in the series and truly worth reading I Swear To Tell the Tooth and The Whole Tooth. The author will complete the series in 2018 with So Help Me God. The only thing I disagree with in Jessyca Garcia's review is her comment, "I also liked that his sarcastic attitude shone throughout all of his stories." The word 'sarcastic' means to mock or convey contempt. I found nothing of the sort in Dr. James' rollicking journey of comedy and drama. I found his wit delightful, not sarcastic. Publishers Weekly review stated, "A wordsmith's agility with language and a comedian's easygoing wit combine to create an engaging, upbeat collection of laugh-out-loud tales." Also, "James is an endearing subject of his memoir, gamely greeting adventures large and small and enhancing each with his wickedly funny inner voice. He is generous and gentle in his depictions of family, friends, and fellow travelers, making the tales of his life a most enjoyable and satisfying journey."